Amazon's Original Content Primes The Pump For Bigger Sales The company has a history of mediocre self-produced programming, but now it's putting more money and talent into its movies and TV shows. It's betting that better shows will lead to more online sales. 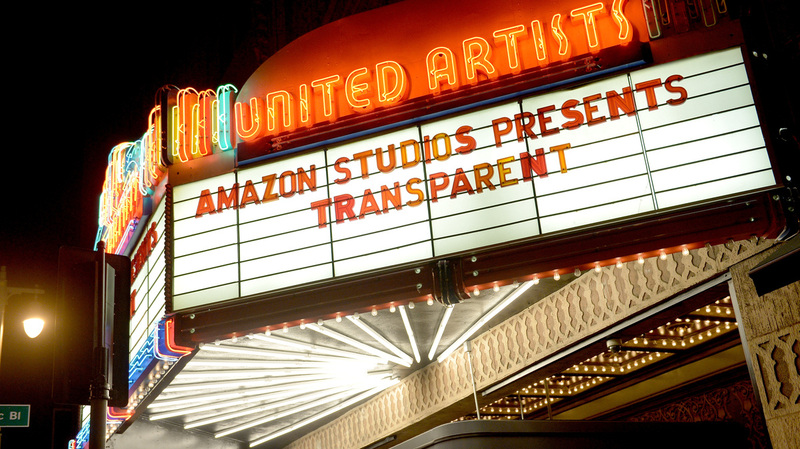 Amazon recently premiered its new dramedy Transparent. The massive retailer is banking on its original TV content to rope in new customers. Amazon is betting that binge-watching will lead to more online buying. On Friday, the company put up all 10 episodes of a highly anticipated series called Transparent, a show about a transgender parent coming out to her children — just one of a spate of original movies and TV shows coming out this year. Though the online shopping giant has a history of mediocre self-produced programming, this time it's bringing in some big name talent and putting a lot more financial muscle behind its efforts. This push is part of a much bigger plan by Amazon that includes original video games and books. Roy Price, the head of Amazon Studios, says getting arts and entertainment to its customers is in Amazon's DNA. "We sell a wide variety of products, but we do have our origin in books and movies and music and stories," Price says. So in 2011, the company made access to a streaming video service part of Amazon Prime, the retailer's premium service. Prime was initially set up to provide free two-day delivery for an annual fee. Price says adding exclusive content is a way to make Prime more appealing. "It adds special value to the service to have something completely unique and original that was developed with that customer group in mind," he says. And with the idea in mind of bringing in a lot of new customers as well, says Wedbush Securities analyst Michael Pachter. He says it's about a lot more than getting them to watch TV. "Amazon concluded a few years ago that if you give people only free shipping they're less likely to sign up than if you give them free shipping plus free media," Pachter says. And Pachter says there is a connection between people who sign up for streaming video and people who end up buying a lot of other stuff, from appliances to lawn furniture. "I've asked Amazon about it and they've confirmed ... that once someone joins almost invariably their consumption goes up," he says. "You know, once you've paid for it you might as well use it." Pachter says this goes for Amazon's investments in other original media, like its recent purchase of the live streaming game site Twitch TV for a billion dollars and its investment in original games, plus its self-publishing platform. All are meant to bring in customers who will spend money on other products. Amazon Studios head Roy Price says the company is also challenging the way that traditional media companies work with artists. Self-publishing has meant that authors can go directly to readers; Amazon TV allows anyone to submit a script. "Anyone can upload a script to our website for a movie or a TV pilot," he says. "And we read all of those and we have turned a couple of the TV pilots into actual pilots that we shot and put on the site." Though traditional Hollywood has always had focus groups, Amazon lets audiences vote directly on which pilots will get turned into a full series. And Amazon is attracting well-known Hollywood names. Shawn Ryan, the creator of the popular FX cop show The Shield, is now making a pilot for Amazon. It's based on a British black comedy called Mad Dogs, about a group of old friends who come to spend a weekend with an old buddy who lives in Belize, only to find out he's gotten mixed up with some bad people. Ryan says he likes having new players like Amazon in Hollywood. "It feels like they're willing to experiment, they're willing to take risks [and] they're willing to try to be different," he says. They're willing to take risks because they are trying to get leverage with other big media companies. Amazon had a contract dispute with Disney this summer and it is still locked in a contract battle with the publisher Hachette. Analysts say the company wants to be in a position where its own original creative content draws so many people these older media entities must be on their site. If Transparent and other upcoming shows turn out to be winners, Amazon is also hoping to achieve another goal: more and more customers clicking and buying the packages that wind up on their doorstep.